Marywood University and BlackOut Design have a great relationship, considering that four of us at BlackOut are Marywood alumni. When the opportunity was presented to update the University’s Pacer Investment Fund, we jumped. 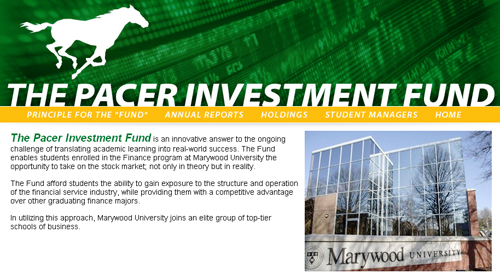 The Fund enables students enrolled in the Finance program at Marywood University the chance to take on the stock market; not only in theory but in reality. Students involved with the Fund learn the nuances of the investment process, the importance of balancing risk and returned, and the critical research that goes into making successful investment decisions. We hope that our efforts will create further awareness for Marywood University and the great possibilities that they provide. Feel free to check out The Pacer Investment Fund in order to see an example of our work as well as to learn more about this asset to our community.